Martin of Troppau or Martinus Polonus was one of the best-selling authors of the middle ages. Following his ecclesiastic training in Prague, Martin held the position of chaplain of the papal curia by 1261. While in Rome, he wrote a history of the popes and emperors in fifty pages. It listed events under each pope and emperor, dispensing with 'minor' figures such as the kings of France and England. 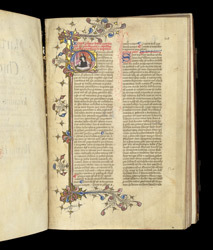 This reduction and the book's unique graphic layout formed the brilliance of Martin's idea: the book set out the papal and imperial reigns facing each other on separate pages, giving one half page to each pope or emperor. This format necessitated the inclusion of legends and myths to fill out the shorter reigns, including the story of Pope Joan, a feature drew a huge readership. Martin had intended it as an aid to theologians and lawyers which could be appended to earlier histories and canon law books. It continued to be of interest in England, influencing 15th-century historians writing in English and Latin, although some features of the unique graphic layout were not copied in later manuscripts. This manuscript from the Benedictine Abbey of Glastonbury is testimony to the durability of Martin's work as well as to the loss of the original page layout. The first page of the 'Chronicle of Popes and Emperors' begins the prologue. A portrait in the first letter shows Martin of Troppau, happily dipping his quill into an inkwell in an elegant niche while a page he has already written dries to his left.